I have always been fascinated by wind pumps and wind turbines. I admired farmers when I thought about using the wind to do simple work like pumping water for livestock. 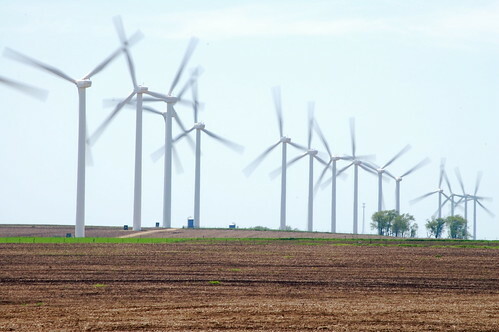 It's no surprise then, that the wind farm at Cobb, WI, has been an interest. Yesterday, while Reena and I were out blasting around southwestern Wisconsin on our motorcycles, we found ourselves near Cobb with time available. We got about as close as you can get to the windmills and I hauled out my camera and tripod. This was absolutely the worst time of day for taking these pictures. It was mid-afternoon and we were looking west, so the sun was a bit in front of us, and the sky was hazy with a thin layer of white clouds. Clearly I was not going to get a beautiful, sell-it-to-the-power-company photograph. But, I was there and so were they, so I took photos. I like this one as it sort of isolates the power of the turbines. I should note that I don't use much in the way of post-camera software to "correct" my photos. I'm working hard at being a better photographer rather than a better Photoshop wizard. I use iPhoto to do some minor corrections to exposure, and maybe a bit of color correction (dangerous ground for a colorblind guy!). The sky was hazy white, so I get photos of a hazy white sky and don't turn them blue outside of the camera. Perhaps I'll change my tune some day, but for now, that's my focus. 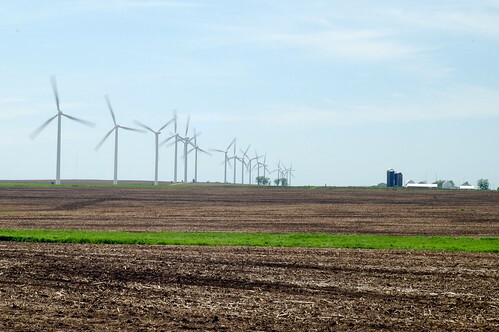 I really like the idea that this wind farm is situated on a working food and dairy farm. It's like some Wisconsin trifecta: Bread Basket provider, Meat Locker provider, and Renewable Energy provider. That truly says "Wisconsin" to me! Maybe not the most beautiful of your photos, but really powerful. Hope you and Reen had a wonderful ride yesterday!